Prairie Moon is a long-time Evanston, Il., standby when it comes to casual, fun restaurants. But because it’s menu skews a bit Cajun and barbeque, I haven’t been to eat there since my angioplasty two years go. My wife recently decided we should go there with friends for dinner, though, so I braced for maybe at most a salad. But I was pleasantly surprised that the chefs there were able to modify a menu offering and still keep it tasty and hearty. Kudos to you, Prairie Moon. 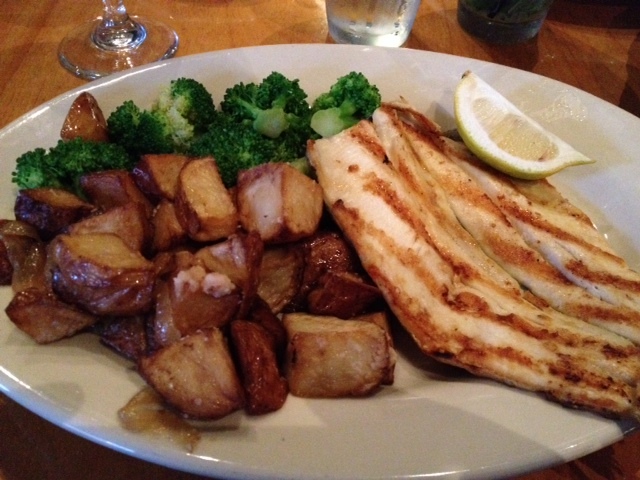 Trout, potatoes and broccoli at PRairie Moon, no salt and no crust but wonderful in taste and simplicity. Looking at the menu, which includes both large and a small plate offerings, I was thinking fish would be the least salty, least fat-filled offering I could get. Both salmon and trout are on the menu but each dish has no-nos for me. The salmon comes with mashed potatoes and butter. The trout comes with a pine-nut crust. I don’t eat nuts and usually crust means salt, either in cheese or some other way. So I asked for the trout without the crust, simply grilled. The waitress said that would be no problem. I also asked for no salt on the sides, roasted potatoes and broccoli. The plate arrived full and looking delicious. The trout was grilled, having a wonderful smoky flavor, as did the potatoes. I tasted a little salt on the potatoes, but not the usual ton. The broccoli was cooked al dente, a bit undercooked for me, but fresh and flavorful in its own right. The trout also was butterflied, an unusual presentation that I enjoyed, and boned expertly, not an easy task with boney trout. Add in a glass of red wine called Xavier, the same name as my high school, and I had a wonderful meal with no hassle when it came to ordering. Others at my table got pork chops, fish tacos and a Gulf Shrimp & Crawfish Étouffée that looked and smelled amazing. Prairie Moon is a restaurant where special orders, to hold the salt, fat and sugar, don’t seem to upset them and where the result is still a great night out meal.